Ocean plastic from Alaska, Greece, Hawaii, Costa Rica and the Gulf of Mexico; steel armature, driftnets and floats from the N. Pacific Gyre. This work is made of over 1,000 pieces of ocean plastic removed from beaches of Alaska, Greece, Hawaii, Costa Rica and the Gulf of Mexico. 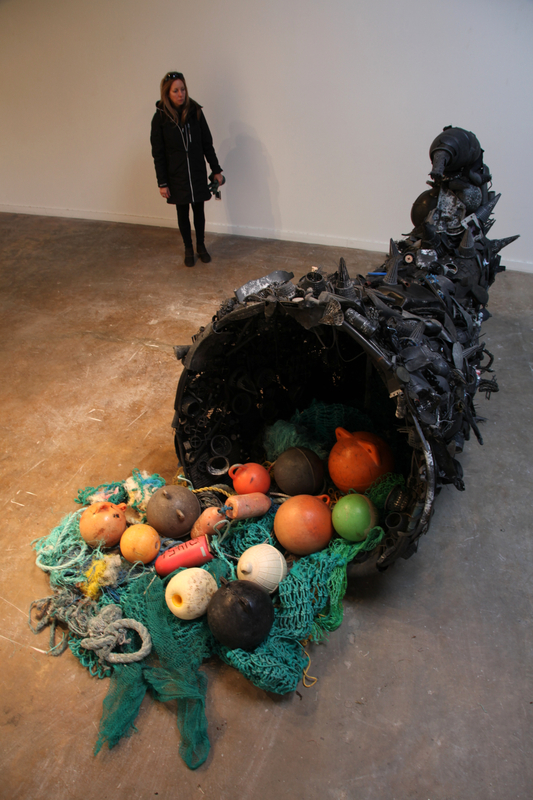 The title refers to the ubiquitous waste associated with disposable vagrant plastic as a ‘squandered horn of plenty.’ The black color of plastic most particularly points to its origin in oil, and the title Bounty, Pilfered also shadows the initials of BP, the irresponsible mega oil conglomerate responsible for the Deep Water Horizon spill that has forever altered the bountiful life of the Gulf of Mexico.